Half-round windows give your home a contemporary look and are a very popular type of window in the Raleigh/Durham area. If you are thinking about replacing your windows, there is a good chance you have at least one half-round or circle-top window. These windows are often installed above double hung and picture windows, entry doors, and sometimes by themselves. They add architectural interest to your home and, because they are mounted so high, they can allow light to stream in without violating your privacy. 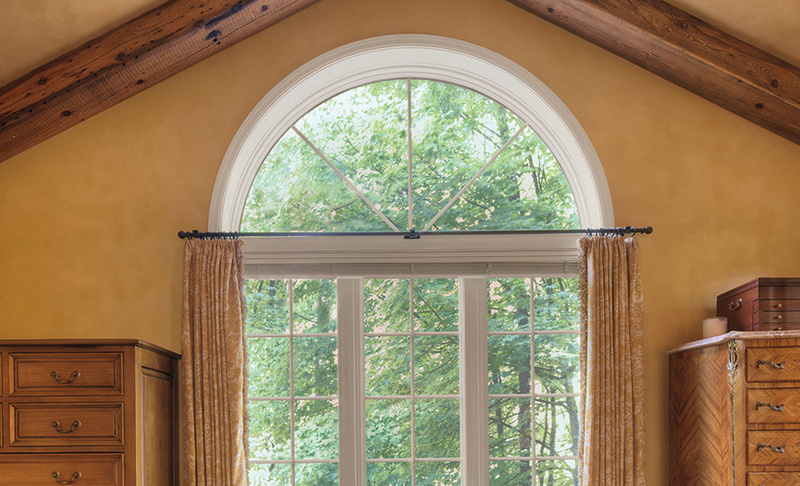 Here at Kelly Window and Door, our half-round windows are custom manufactured to perfectly fit your opening, giving you maximum energy efficiency and viewable glass surface. If you are thinking about replacing the windows in your home, we would love to meet with you (for free, of course!). To get started, just give us a call at 919-461-0010 or fill out the form below. We look forward to hearing from you! Interesting fact: A curved window that is not a perfect half-circle is called an eyebrow window. We can replace those too. Wonderful job – highly recommended. Installers were fabulous. Windows and trimwork look great. Love the new door. Appreciate the team going above and beyond to remove ceramic artwork from the old door. Many thanks to your team for professional install and clean-up.